This Background Paper is the full "Antarctic climate change and the environment: an update" paper recently published in the journal Polar Record. It should be read in conjunction with the Working Paper that summarises the key highlights. 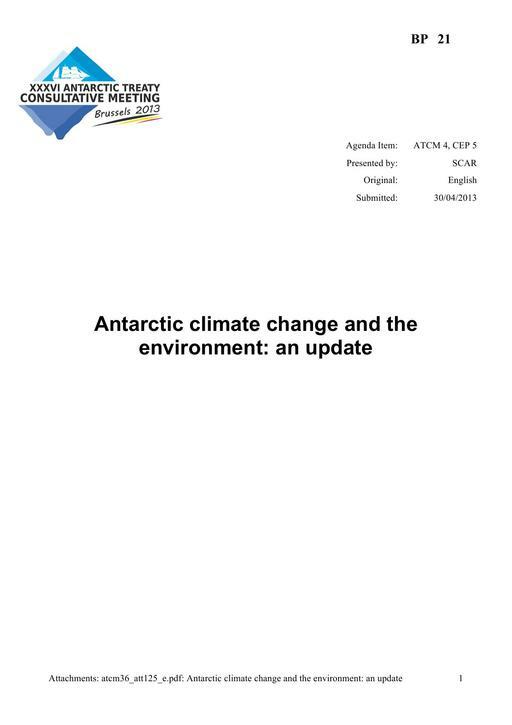 The paper presents an update of the 'key points' from the Antarctic Climate Change and the Environment (ACCE) report that was published by the Scientific Committee on Antarctic Research (SCAR) in 2009. It summarises subsequent advances in knowledge concerning how the climates of the Antarctic and Southern Ocean have changed in the past, how they might change in the future, and examines the associated impacts on the marine and terrestrial biota. It also incorporates relevant material presented by SCAR to previous Antarctic Treaty Consultative Meetings, and make use of emerging results that will form part of the Intergovernmental Panel on Climate Change (IPCC) Fifth Assessment Report. The paper is available as attachment 125 ( pdf ATT125 (206 KB) ) and online from Cambridge University Press. Note that this has been made available to the Treaty with kind permission of the journal Polar Record. The Copyright remains with Cambridge University Press.